Flabby or Jiggly arms can be really embarrassing. You are not comfortable in sleeveless outfits, you look unfit and aged. It ruins your entire look. Don’t worry I am here with 10 exercises with which you can get rid of your flabby arms. Join your hands and make a prayer pose above your head. Bring them in front of your chest and again raise your hands above your head. Repeat the exercise for 30 times. Move both hands over your head. Hold your left wrist with your right hand and vice-versa. Interlock both your hands. Start stretching your left hand to your right behind your head. Follow the same process with your right hand. Repeat two sets of 20 for each hand. Keep your hands in the front, parallel to the floor at your shoulder level. Now pull them up and start rotating them in a 360-degree motion like blades of a windmill. Do it 20 times backward and forward respectively. Move your hands to your side to the shoulder level. Start waving your palms in a way you say goodbye to someone. Move your palms while keeping your arms still. Wave for 1 minute at a speed of 100 times. Repeat three sets of 100 times for each hand. Stand straight with shoulders wide apart, hold a barbell in your hand facing the ground. Bend your knees slightly forward while keeping your back straight, heads up and hips parallel to the ground. Hold your breath and start pulling the barbell close to your chest, below the ribs and exhale. Hold this posture and squeeze your back. Come to the starting posture and repeat the exercise. Lie on the floor on your side with slightly bent knees. Keep your left hand on your right shoulder and push your torso upward, keeping the right arm on the ground and palm facing straight up. Switch side and repeat the same. Take the regular push-up posture with palms down, shoulders wide open, and bend your arms slightly. Join your feet and support your body weight on your toes and hands. Hold your breath and touch the floor with your chest. Exhale and start pushing your body upwards to the starting position. Hold as long as possible and repeat. Stand straight, bend your knees slightly, back straight and bend forward a little parallel to the ground. Head up, arms close keeping a 90-degree angle between your upper arm and forearm. Lock your shoulders and extend your arms and wait for 2 seconds and repeat. 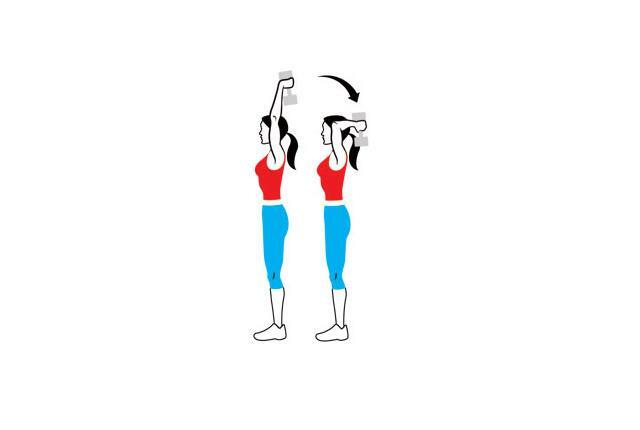 Stand straight, shoulder wide open, hold the dumbbells using both hands behind your head, elbows close to your eyes, upper arms close to your chest. 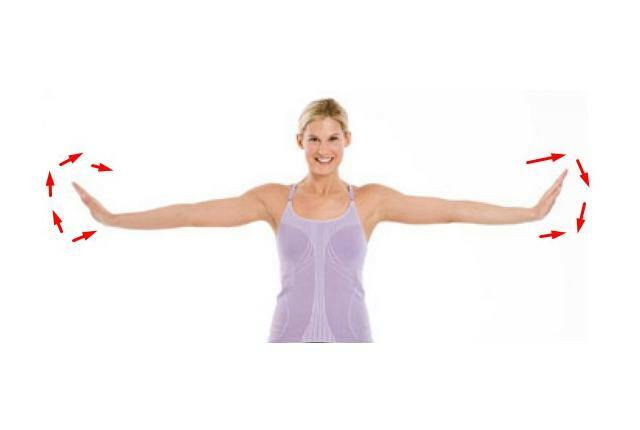 Lower the upper arms, touch your upper body and do not move your elbows. Use your triceps and raise the dumbbells up. Grip a bench or rack, place your hands behind your back. Start lowering your body with the help of your triceps and keep your elbows at 90-degree angle and repeat the process from starting position. Do these arm exercises a few times a week. They are really effective. You will get to see noticeable changes in a month. You can take foods with amino acid along with the exercises for a better result.